University of Illinois electrical and computer engineering professor Viktor Gruev led a study demonstrating underwater global positioning made possible by a bio-inspired camera that mimics the eyes of a mantis shrimp. CHAMPAIGN, Ill. — The underwater environment may appear to the human eye as a dull-blue, featureless space. However, a vast landscape of polarization patterns appear when viewed through a camera that is designed to see the world through the eyes of many of the animals that inhabit the water. University of Illinois researchers have developed an underwater GPS method by using polarization information collected with a bio-inspired camera mimicking the eyes of the mantis shrimp. The findings, published in Scientific Advances, are the first to demonstrate passive underwater GPS using the polarization properties of underwater light. This technology could open new possibilities for undersea navigation and understanding of the migratory behavior of marine animals. The camera, a variation of a polarization imager named Mantis Cam after the shrimp that inspired it, takes advantage of how light refracts, or bends, when it passes through the surface of water and bounces from particles and water molecules. After returning to the lab, Gruev and graduate student and co-author Samuel Powell determined that the underwater polarization patterns are a result of the sun’s position relative to the location where the recordings were collected. They found they can use the underwater polarization patterns to estimate the sun’s heading and elevation angle, allowing them to figure out their GPS coordinates by knowing the date and time of the filming. This research could also lead to new insights into the migratory behavior of many marine species. Another aspect of this technology is its potential to help researchers understand how pollution may alter the migratory paths of animals sensitive to polarized light. The National Science Foundation and the Air Force Office of Scientific Research supported this study. 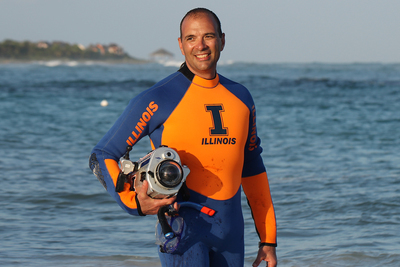 Gruev also directs the Biosensors Lab at Illinois.